BAN vs WI 2nd test of Windies tour of Bangladesh 2018 is being played in Shere Bangla National Stadium Dhaka from 30 Nov to 04 Dec 2018. Bangladesh did this miracle in this Bangladesh vs West Indies 2nd test 2018. Soumya Sarkar, Shadman Islam, Mominul Haque, Mohammad Mithun, Shakib Al Hasan, Mushfiqur Rahim(wk), Mahmudullah, Liton Das, Mehidy Hasan, Taijul Islam, Nayeem Hasan. Kraigg Brathwaite(c), Kieran Powell, Shai Hope, Sunil Ambris, Roston Chase, Shimron Hetmyer, Shane Dowrich(wk), Devendra Bishoo, Kemar Roach, Jomel Warrican, Sherman Lewis. The players of Bangladesh have shown the amazing performance in this match Mahmudullah has given the strength to the team with his century. Bangladesh could build a big score 508/10 with the help of his century. He scored 136 runs with the help of 10 boundaries. Shakib Al Hasan 80 and Shadman Islam supported with 76 runs to reach this big total. Liton Das also got a half-century in this match. He was only one player who smashed a six in this inning. He scored 54 runs in which he smashed 6 boundaries and a massive six. 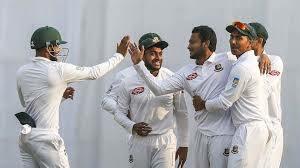 Bangladesh scored 508/10 in the 1st inning of BAN vs WI 2nd test in Windies tour of Bangladesh 2018 cricket test series. Kemar Roach, Jomel Warrican, Devendra Bishoo, and Kraigg Braithwaite got the 2-2 wickets. While Sherman Lewis and Rosto chase got the 1-1 wicket in this cricket test match. The bowlers of Windies failed to stop Bangladesh from building this big score. Windies failed to score a good total in his 1st inning. This team couldn't protect them from playing follow-on. Mehidy Hasan got 7 wickets while Shakib Al Hasan got the 3 wickets of Windies. Only the 3 players could score runs in double-figures. Shimron Hetmyer 39, Shane Dowrich 37 and Shai hope supported with 10 runs. But such performance was not sufficient to save their team from follow-on. Windies could score only 111/10 in his 1st inning. Windies all-out in only 34.4 overs and moved to play follow-on. Bangladesh did this miracle in this Bangladesh vs West Indies 2nd test 2018. Windies started his 2nd inning and his first target was 397 runs. Shimron Hetmyer played an amazing and blasting inning. He scored 93 runs which were the highest individual score of any windies player in this inning. He faced only 92 bowls and smashed 1 boundary and 9 sixes in his inning of 93 runs. Kemar Roach 37, Shai Hope 25 and Sherman Lewis played an inning of 20 runs. But they couldn't restrict Bangladesh to win by an inning and runs. Mehidy Hasan again did the great bowling performance. He got 5 wickets in the 2nd inning of Windies. He got 12 wickets in this BAN vs WI 2nd test of Windies tour of Bangladesh 2018 test series. Taijul Islam got 3 wickets while Shakib Al Hasan and Nayeem Hasan got the 1-1 wicket in this match. Windies all-out at 213 runs in his 2nd inning. Bangladesh won this match by an inning and 184 runs. Bangladesh was strong in both section bowling and batting in this match. This team scored 508/10 with the help of the century of Mahmudullah. Mehidy Hasan got 12 wickets and got the team to win by an inning and 184 runs. Hetmyer's inning of 93 runs with 9 sixes was fabulous.